Building on the success of the award-winning digital signal processor (DSP)-based DRI250, Texas Instruments Incorporated (TI) (NYSE: TXN) and iBiquity Digital Corporation, the sole developer and licenser of HD RadioTM technology, today announced the availability of two new single-chip HD Radio basebands - one offering HD Radio technology and the other combining HD Radio technology with analog AM/FM. Depending on their design approach, designers can choose either of the new digital basebands from TI to provide them with the industry´s lowest cost solution for building an HD Radio receiver. The new digital basebands integrate TI´s expertise in DSP technology with software developed by iBiquity Digital Corporation to provide all of the digital functions required to build an AM/FM and HD Radio receiver, in addition to allowing for audio post processing and MP3 and Windows Media Audio (WMA) CD support. "We continue to drive towards more affordable HD Radio solutions, and therefore are very excited to see TI setting the standard on the lowest pricing yet," said Jeffrey Jury, COO of iBiquity Digital Corporation. "This standard was initially set with the pioneering endeavor of TI's DRI250, which placed AM/FM and HD Radio technology on the same chip. TI's new basebands take this innovative architecture one step further by reducing its costs significantly." 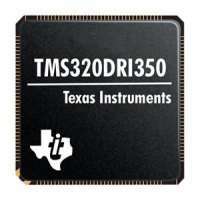 The new TMS320DRI350 brings unparalleled integration of HD Radio technology by combining IF-sampled AM/FM and HD Radio processing on the same chip. This integrated design approach is the lowest cost implementation of HD Radio technology. In addition, TI is responding to manufacturers' demand for an HD Radio-only solution with its new TMS320DRI300 baseband, providing HD Radio functionality, while allowing OEMs to continue using their own proprietary designs for AM/FM support. The DRI300 allows manufacturers to build on existing solutions and easily add digital radio capabilities. While not as low cost as the integrated design the DRI350 offers, the DRI300 provides the industry's lowest cost for this particular design approach. The DRI350 and DRI300 both use a software radio concept, which lowers risk by allowing for the addition of future features even after the development begins. A clear example of this is the addition of Tomorrow Radio, a dual-channel radio capability for HD Radio receivers, which has now become a standard and integral feature of TI´s HD Radio basebands. In addition, this approach allows for the integration of other features in an HD Radio receiver including MP3 and WMA CD decode. "The new low-cost DRI350 and DRI300 basebands build on TI's close relationship with iBiquity and our position as the technology driver in digital radio worldwide," said Naresh Coppisetti, Digital Radio business manager at TI. "For instance, TI currently has the only basebands that offer dual-channel radio as a standard feature. As a pioneer in the HD Radio market, TI continues to set the standard in HD Radio technology with highly integrated software radio solutions that fit manufacturers' design needs at a much lower system cost." The DRI350 and DRI300 basebands are complemented by TI´s mixed-signal DRI8201 chip, which provides the precision intermediate frequency (IF) analog-to-digital converter (ADC), digital down converter (DDC) and control digital-to-analog converter (DAC) needed in a complete digital radio design. The DRI8201 uses an 80-megahertz (MHz), 12-bit ADC to digitize the AM/FM IF signal from the radio tuner with the high precision needed for optimum AM/FM and HD Radio performance. Samples of TI´s DRI350 and DRI300 HD Radio basebands are available now with volume production expected in the fourth quarter of 2004. TI´s mixed-signal DRI8201 chip is available now.